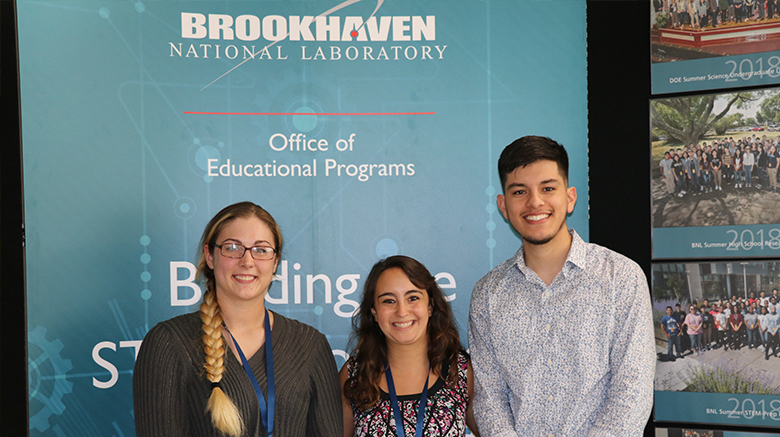 Three students from SJC Long Island participated this summer in the 2018 Science Undergraduate Laboratory Internship (SULI) at Brookhaven National Lab (BNL) in Upton, New York. The internship program — open to college students across the country — kicked off June 4 and concluded Aug. 10. The students presented their research findings during a poster session last Thursday. As many as seven St. Joseph’s College students get accepted into this highly competitive internship each year, according to S. Jane. An informal collaboration has existed between St. Joseph’s and BNL for over two decades. In addition to choosing St. Joseph’s students as interns and employing graduates of the College, they have also aided the institution in receiving major grants through writing letters of support.